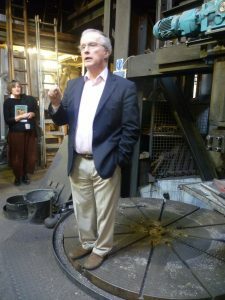 Last week, I had the good fortune to visit the Whitechapel Bell Foundry, founded in 1570, and in Whitechapel Road since 1738. Now, nearly 450 years later, it was to close, and our tour was the very last one. Mr Alan Hughes, the owner, whose family had been there since 1904, and who was born there, was our guide. It was the Whitechapel Bell Foundry that cast the 13½ ton hour bell, Big Ben, for the Palace of Westminster in 1858. 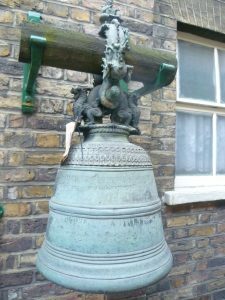 It also replaced a number of famous church bells lost in the London Blitz, including the ‘great bell at Bow’, as the Nursery Rhyme has it, and the ‘Oranges and Lemons’ bells at St Clement Danes. Whitechapel bells are found in countries as far apart as Australia, South Africa and America. When the foundry moved to Whitechapel Road in 1738, it took over the 17th century Artichoke Inn. A map shows a large open yard at the back, a gateway to a convenient side road, stabling, and a smithy: in short, there was plenty of room for the foundry to expand into. The yard space was turned into a foundry with a ceiling with windows for light, and overhead tracks for moving heavy equipment. 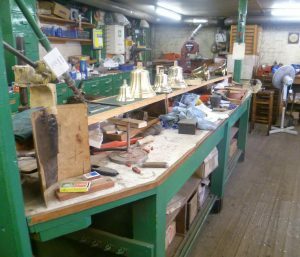 I’ve always enjoyed seeing traditional workplaces; they often look chaotic, overcrowded and dirty, and the Bell Foundry is no exception. But, as I was to learn, everything was in the right place for the work it had to do. For example, there were four pails containing sand, horse manure, goats’ hair and clay to create the moulding loam – as has been done since medieval times – and a number of different-sized outer moulds, called copes. The inner mould, the core, is shaped using a moulding gauge. It is highly-skilled work. Cope and core have then to be fitted together precisely and cast, with the bell metal carefully poured into the gap between the two moulds. Bell metal is an alloy: 77% copper to 23% tin. It is hard, which gives the bells their fine ring tone, but it can be brittle and needs careful handling. 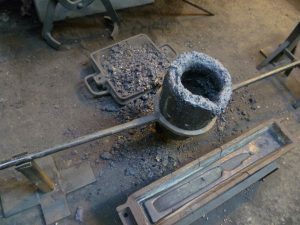 One the metal has cooled, the cope is removed to reveal the bell, which must then be cleaned, tested, drilled and tuned. This is a complex business. Modern church bells are tuned on the ‘five tone’ system which is basically a blending of tones to create depth in the note desired, but, at the same time, making sure that the bell will tone sympathetically with the other bells in the belfry. Tiny adjustments are made to the bell by trimming excess metal with a lathe and constantly measuring the frequencies using modern electronic equipment until the tone is perfect. 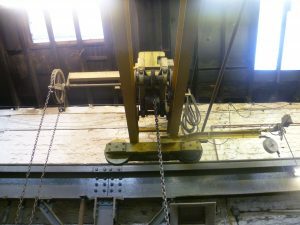 The bell is then moved to the Fittings and Framework workshop. This is another large room with ceiling windows and equipment to lift the bells. 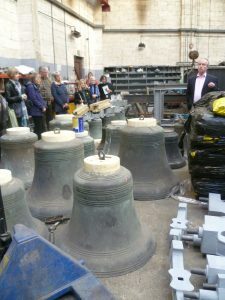 The fittings include custom-made wrought iron, timber frameworks, casting iron and steel – whatever is needed to hang the bells safely and securely in their final destination. But the foundry isn’t all about large church bells. 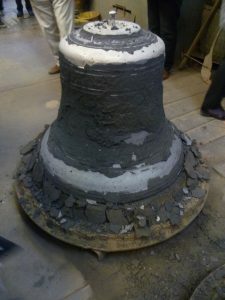 The foundry casts smaller bells as well: ship’s bells; school bells; town crier’s bells; sets of hand bells, etc. Again, tools lie piled up everywhere. 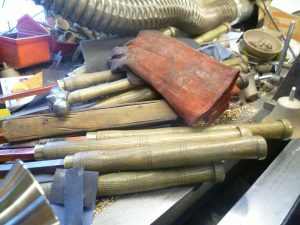 It looks chaotic, but each tool is there to do a very specific job. The snake-like tube at the top of the photo is an extractor to remove any dust. And it’s needed; a box on the wall labelled Emergency Eye Wash Station, and the thin twists of shiny metal everywhere demonstrate that this is, potentially, a dangerous place. So, what happens now to Britain’s oldest manufacturing company? 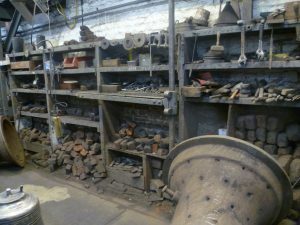 Mr Hughes told us that the very last bell cast was for the Museum of London, to which the foundry is donating many artefacts, including old machinery. And the foundry archives are going to the London Metropolitan Archives, where they will be made available to the public. He has made arrangements with Westley Group Ltd to cast the Whitechapel bells; Whites of Appleton, Church Bell Hangers, have bought the pattern equipment to make Whitechapel components (they have been dealing with the foundry for 197 years); and Whitechapel musical hand bells and other musical accessories will be available from Bells of Whitechapel Ltd. 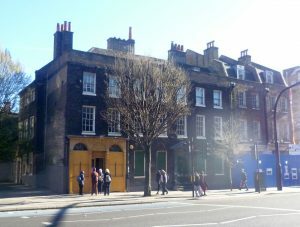 The building itself is Grade II listed, and its new owner will respect its historic status. Mr Hughes’ talk was fascinating: everything was explained clearly, fluently, and with a humorous touch. He was bravely up-beat about the future. All the same, it must have been a heart-breaking decision to make. That was totally fascinating Elizabeth. How wonderful to be there on the last day, but sad to see such a piece of history vanish. They are using our company because we are based locally and we have years of expertise in the auction scene. Thank you for the information, Mr Azeez. 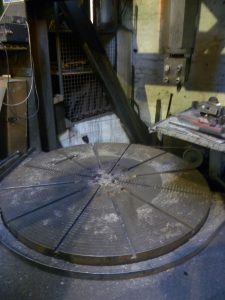 I can confirm that there are lots of fascinating objects – interesting, beautiful, and useful in the bell foundry. This is your opportunity to buy a piece of history! Wonderful, Elizabeth, thank you. Such heritage is contained in this foundry, but hopefully the efforts that have been made to record and preserve it will help future generations to understand what went on here. I am sure tuning the bells is a skilled job today, but think what a craftsman would have been required to do this by ear. That’s just what I was thinking, Melinda, though I understand that, until the early years of the 20th century, bells were just tuned to the ‘strike note’ of the bell. The development of ‘Harmonic tuning’ allowed the tone of all the bells together to be more in sympathy, especially in ‘change-ringing’ which involves mounting bells on a full wheel so that they go through a full circle. This gives a bell-ringing team control over the timing of each bell. Incidentally, bell ringing, as we know it, is only done in England. I’d no idea it was all so complicated! 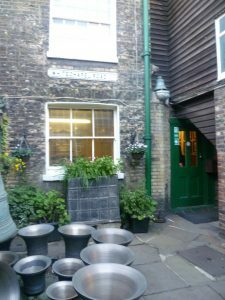 I loved reading about the Whitechapel Bell Foundry and would really like to email you directly about the article if possible. Thank you for your comment, Eve. I’m delighted you enjoyed the post. It was a wonderful place to visit and a poignant one, too, as we were the very last group to see round it before it closed forever.